Hello and happy Saturday! 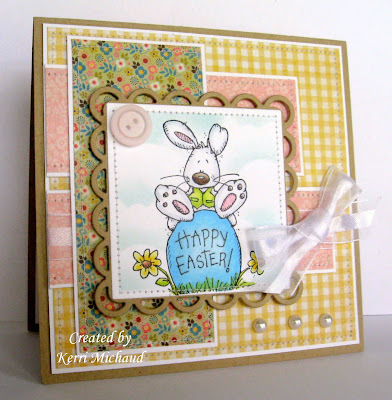 With Easter being only a week away, I've been trying to finish up a few Easter cards:) Every year I have to make one using this adorable Whipper Snapper Designs image Easter Egg Bunny~so CUTE! The dp is some My Mind's Eye Gertie and I used some GORGEOUS Sheer Organza with Satin Center White Ribbon from Really Reasonable Ribbon to tie a pretty bow. The layout is the April Jen's Sketch For You To Try. I hope you enjoy my creation today! Thank you so much for stopping by and I hope you have a wonderful weekend! So sweet! An adorable image and paired up with that great PP and the kraft it is all good! 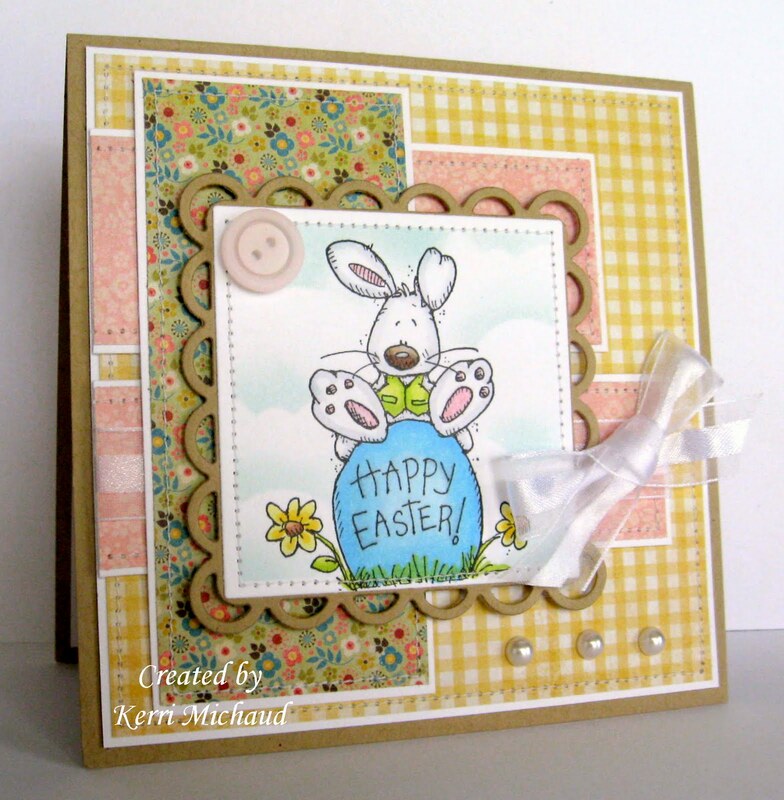 What a sweet Easter card, Kerri! FYI...I posted a link to the pinwheel tutorial on my blog along with a couple of other new tutes. I hope you don't mind my linking your card with the little pinwheels as well. This is just the sweetest little easter card! I love the soft colors and everything about it! Kerri this is darling!! Your color combo is fantastic and your image is colored to perfection my dear! What a sweet Easter card Kerri! The image is so lovely! Adorable, awesome coloring and fun image. Oh, this is cute and fabulous! Love the image! Oh my goodnessssss this is the cutest EVER!!!!! Absolutely LOVE this paper and the image with the clouds behind him is tooo cute for words!!!!!! Thanks so much for your kind words about my computer, girl I am crossing everything I get it back today and it works like normal.......So sorry I havent' been by to see your awesome creations!!!!! HUGS! ACK! How CUTE! LOVE this sweet image!!! Oh how cute! That bunny is just adorable! Adorable! Awesome coloring! Love your spring mix of patterns and colors, too! Oh that bunny is the CUTEST and your sky background is beautiful! !